For the best optimization and potential of the performance of the workplace, organizations must align between three components of the workplace: people, process, and place. Organizations ought to utilize strategies to allow leadership to clearly communicate organizational pursuits and objectives with employees to align individual pursuits with organizational pursuits. They also need to use the physical workplace as a strategic vehicle to accommodate the ways work is done most efficiently and effectively for the specific types of tasks and enhance the most desirable organizational culture, cultivating highly performing corporate DNA. IWI helps organizations optimize their workplaces via prioritized recommendations based on decades-long research in workplace performance and evidence-based practice using workplace performance analytic platforms. 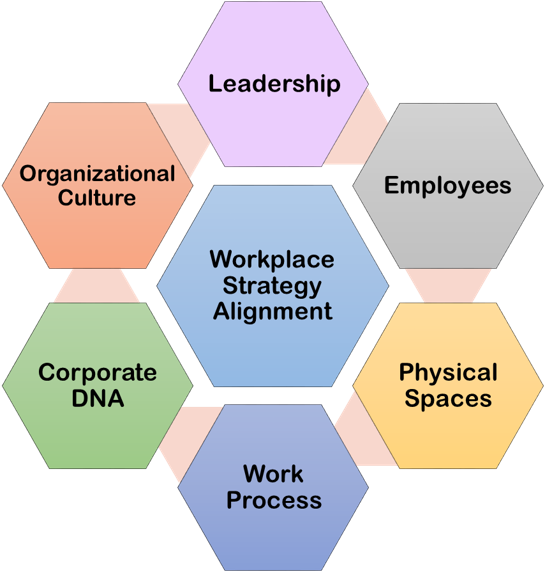 IWI, especially, focuses on six key factors of workplace strategy alignment between leadership, employees, physical spaces, work process, corporate DNA, and organizational culture.